Democrats, a word to the wise. During his visit to the town on June 3, Vice President Al Gore promised millions of dollars in federal funds which was used to help the storm victims’ immediate needs as well as the actual rebuilding of Spencer’s streets, schools, library and ball field. Footnote - The only problem was that Spencer didn't have a library. And I'm not so sure it had a school. Or a ball field. I know there was at least one paved road, but don't ask me about more than that. "In case you missed it, this week, there was a tragedy in Kansas. Ten thousand people died — an entire town destroyed"
Footnote - 12. It was 12 people that died. Yesterday, it came out in the media that the Attorney General Larry Long asked Legislative Audit to look into the fact that taxpayer money was being used to sue the state..... to get more taxpayer money. Good for him. I think it's past time that this portion of the campaign be reviewed in depth. Long says schools lack legal standing to challenge the constitutionality of state laws and are barred from paying any legal fees except their own. He released on Thursday copies of a letter to Auditor General Martin Guindon that requested the audit. In Easy Questions, Easy Answers, he intimates that the church's position on celibacy for priests is "nuts." and in No communion for you!, he assumes certain things on the priority of the church; "obviously nothing more important to the Catholic Church than the position that American politicians take on abortion rights." It is troubling to me that while bloggers on the left advocate for special protections for groups because they believe they are targets for hate speech, they engage in the very types of behaviors they advocate stopping for the groups they favor. unscientific Poll - GOP for Gov in 2010? Say it loud and proud - and tell us why. They were supposed to return to the United States with their new additions on April 14 and 15, but a problem with the State Department computer used to issue visas to the adopted children caused a several-day backup for nearly 100 families. So Richardson started calling people. She started with Rep. Stephanie Herseth Sandlin’s staff member in charge of immigration, Mark Gerhardt, who had helped the Richardsons expedite their Orphan Child/Immediate Relative petition in February so they could travel to China. Gerhardt made the State Department’s China desk aware of the visa problem. Thune, meanwhile, went right to the boss. I want to be in pictures. But Jae managed 4 scenes. I'd love to be in film, mainly because I'm such an unabashed fan boy. But unlike me, Jae Csongradi up at the Office of School and Public Lands managed to be in 4 scenes shot for the National Treasure sequel out at Mt. Rushmore. A Pierre woman made the most of her time as a movie extra. Jae Csongradi last week spent about eight hours one day last week on the set of the sequel of the "National Treasures" being filmed in Rapid City. While some others have only been in one or two scenes, Csongradi got the chance to be in four scenes shot at Mount Rushmore.Read it all here. And Congrats Jae. We're all looking forward to seeing you on the big screen. No sooner than did I get into the afternoon yesterday, and I had to come to Brookings on an emergency basis. I finally have a few moments to check my e-mail, and I noted this new website. And they aren't being terribly nice to our Congresswoman. Some might say they're giving her hell. Others, that they're telling the truth, and it feels like hell. I'll leave it up to you to decide. Federal Hate Crimes legislation – which was aimed squarely at punishing people of faith – passed in the House of Representatives last week. Stephanie Herseth? She voted yes. And this hate crimes law now elevates homosexuals into a separate legal class – above other citizens – reversing our Constitutional guarantee of "equal justice under law." It's Awfully Quiet. Too Quiet. Maybe, we're holding out for a hero. I had a conversation recently with a politico who was commenting that (politically), things are pretty quiet within the GOP. Sure, we're just coming to the end of Lincoln Day Dinner season. But it seems as if a lot of people are chomping at the bit for something. I think it's evidenced by the unabashed frothing that everyone did at the prospect of a congressional candidate as we did when Dusty Johnson noted he was thinking about it. After the beating the GOP took nationally and in the legislature this past election, people are itching for a cause they can sink their teeth into. They're looking for hope. As I was filling out my exit questionnaire at work this AM, it gave me pause to reflect back on my time in Pierre. And as evident from the literally dozens of well wishers in person, via telephone, and e-mail, I need to say "thanks." I'm pleasantly surprised at how they've even come from people I might not have agreed with. (Maybe even one or two I've savaged). If anything, it gives myself permission to reassess my biases. Then again, there have been a couple of people who have used the occasion to take a parting shot. That's great too. They've shown the quality of their character on more than one occasion, so I'm not surprised. I've spun gold out of straw before, and it just gives me more material to spin with. Leaving was a really, really difficult decision, but every hour I get away from the gut-wrenching anxiety of making it, it was the right one. One week after saying he was considering running for the U-S House in 2008, state Public Utilities Commission Chairman Dusty Johnson now says he will not be a candidate next year. In recent weeks, there has been some speculation as to whether or not I would be a candidate for federal office in 2008. I have decided not to run for the U.S. House. In many ways, I am drawn to such an opportunity. I think that, in a few important respects, our country needs to change direction, and I would love to be a part of getting us refocused on real problems and real solutions. 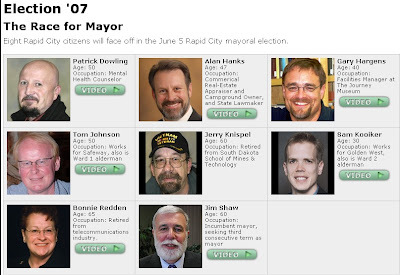 The Rapid City Journal has posted videos of the candidates running for the office of mayor in this years' election, where they lay out their background, and what they want to do for the city. Go check it out here. That's not good. State Employee indicted for bribery, while the rest of them do their jobs. Someone was joking to me yesterday that after I exit from my employment at the end of next week, I might do a blogpost on state employees I hate the most. Cute, but no thanks. Almost without exception, I've known state employees to be exceptionally hard working, often under less than optimal conditions. I believe Seth who blogs (or alt least used to) over at CCK had worked for Social Services down in Pine Ridge. Would you choose that to be your dream job? Exactly. There are tons of others in custodial services, building trades, corrections, and law enforcement who are working evenings and holidays while the rest of us are enjoying our ham dinner. Most don't do it for the pay. It's to feed their families and because they want to make a difference. The home of Ed and Diane Olson, just northeast of Mitchell, was damaged severely by an apparent tornado Saturday. The roof was torn off of the kitchen and living room areas, and one of the living room walls was leaning. Some turkey hunters crouched in a nearby ditch while the storm passed and then rushed up to the house to check on Mrs. Olson, who was home alone. Mrs. Olson said she and her husband, who was in Wisconsin during the weekend, plan to live temporarily in a friend’s rental house in Mitchell.“I’m still in shock,” she said.Read about it here. Jeez. I feel terrible about this. While I certainly have disagreed with Ed on some things such as the Mainstream coalition, Ed is a pretty decent guy. Our thoughts are with him and the others who are going through this. Results from the two polls I posted are coming in, and are interesting to say the least. In the congressional wish-list contest, it looks like the readers are after a certain ideal. Because Larry Russell and Dusty Johnson are neck in neck. Seriously guys, I'm not fiddling with the numbers or anything. This is what's coming in. Even laying relatively low in the GOP political world for the past couple of years, Larry still has a remarkably loyal following among the grassroots. The Dems for Governor results were also interesting. Yes, Heidepreim is running away with it. But it's the also-rans who are getting my attention. BJ and Frank are being picked more often (ar at least about the same) as Congresswoman Herseth Sandlin. And how was your day? Mine was sort of interesting. I think I got a few tongues wagging at work today. "Why?" you might ask. Because I resigned from my job. It's something I've been thinking about for a while. You know, you have a pregnant wife, and six kids to boot, and there tends to be something nagging in your head that says "Hey, it might be a good thing to be around more." Or that could be the television. I'm not sure. It's not that I didn't enjoy the things I've worked on. The Vietnam War Memorial dedication was arguably the single greatest event that ever took place in Pierre. It's not like I could ever top that. Honestly, the coordination and human effort of it dwarfed any political thing I've ever had my hands in. If anything, it provides a new frame of reference to what dedicated people can accomplish if they put their minds to a task. I got a copy of "Under the Dome: trying to do good in the People's Cathedral" today. Written by Former Representative and Senator Gerry Lange, it's a self-published book - 97 pages which are so self-indulgent it would make Onan uncomfortable. Sen. John Thune proposed a major tax break for wind energy, and this week will hear arguments for increasing vehicle fuel-economy standards.Those and other measures could become part of a larger energy bill focused on renewables. But cooperation could fizzle without technological improvements, such as the ability to make ethanol from cellulose or to meet the nation's electricity needs without nuclear power. There also is growing support for wind power, he said. I'm phoning it in tonight. Here's another poll to chew on. I'm back in Pierre early this weekend for an on-site "audition" for a job that would let me spend much more time in Brookings. 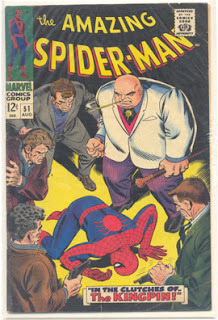 After working all day, I'm tired, and I'm thinking of going to see Spider Man 3, so I'm not going to do much for blogging tonight. So, to fill space, I'm going to throw up another poll for the readers to generate some chatter about the ghost of elections to come. Earlier today, I asked who the GOP is going to put up for congress in 2008 (based on report, rumors and gossip circulating). For those of you grumbling "why I didn't include and west river people," when the chatter starts that they might be interested, I'll include them. Until then, I'll include what I hear. For this poll, I note there's lots of chatter who the GOP is going to run for Gov in 2010, but very few Democratic names are popping up. So let me have it - what do you think the Dems are going to put up in 2010? Here's a little something to chew on this Sunday morning - From this list of oft mentioned candidates, which Republican do you like in the 2008 Congressional contest? Johnson not running. Dusty, that is.